Field of Flowers was founded in 1990 by Donn Flipse, a third generation florist in South Florida, and now has locations covering the Ft. Lauderdale, Miami and Boca Raton metro areas. Field of Flowers has been awarded as “Best Florist” by numerous organizations including the Boca Forum and Sun Sentinel, Davie and Cooper City Gazette, CBS Local Miami has named Field of Flowers the “Best Floral Shop.” We have the largest selection of fresh flowers, flower arrangements and plant gifts, and are open 7 days a week with same day delivery and 2 locations to serve you. Assorted flowers perfectly arranged in the form of a Open Heart on a wire easel to create a stunning display of warm affection that will last in the hearts of friends and family for years to come. Each arrangement is unique and is comprised of various flowers. The image shows just one example. Please note that some flowers, vases and other products pictured are subject to availability, and may be substituted for a similar item if unavailable according to our substitution policy. 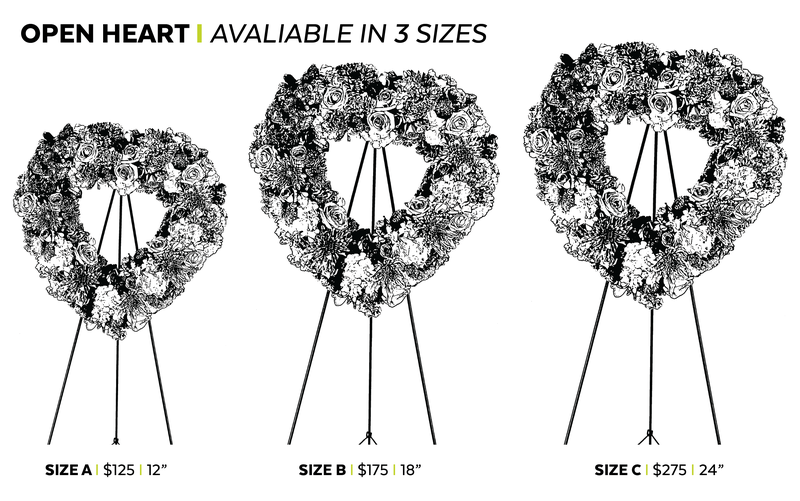 Our designers will select the ribbon color that is most appropriate for your floral selection. The general rule is that the banner should reflect the relationship of the deceased to the sender of flowers.